It would be so much easier if you could just stop thinking that there must be something more. One of the things I do with prospective clients is get on a call with them to see if it’s a fit for us to work together. One of the clues I use to let me know that a prospective client and I aren’t a fit to work together is if they think I have something that I call the magic pill. Some people think I have a secret that I can quickly tell them or some magic I can weave to unravel four decades of struggle in 60 minutes. Although I’m pretty magical, I can’t do that. And if it was that easy, it would have been figured out and put on the market by now. You’d see that magic pill for sale in Target. Believe me, if I could provide a magic pill that would make all that you have feel like enough in your marriage, I would do it. If I could give you a lobotomy for that part of your brain that carries all the regret and pain from past relationships, I would do it. 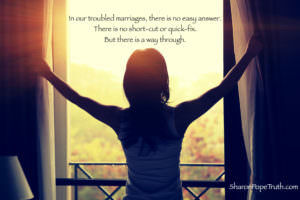 If I could give you a simple secret to a happy and loving marriage, I would do it. I would be rich and my clients would be instantly happy again. Everyone wins! But that’s not the way it works. I can’t create in your physical experience any more than you can create in your husband’s. Yes, I can guide you. Yes, I can equip you with tools you didn’t have before. Yes, I can teach you and challenge you and inspire you, but I am unable to create for you. If there was a magic pill, honestly, I would have found it years ago when I was going through this myself in my marriage to my first husband. This journey you’re in that we call life, is yours to do. There is no easy answer. There is no short-cut or quick-fix. There is a way through. I don’t have some magic pill, although I like to think the work I do creates miracles.